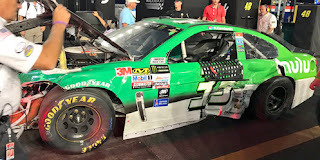 Jeffrey Earnhardt picked up the 5th last-place finish of his Monster Energy NASCAR Cup Series career in Saturday’s Bass Pro Shops NRA Night Race at Bristol at the Bristol Motor Speedway when his #33 Hulu Chevrolet was involved in a two-car accident after 225 of 500 laps. The finish, which came in Earnhardt’s 46th series start, was his fifth of the season and first since the Coca-Cola 600, 12 races ago. 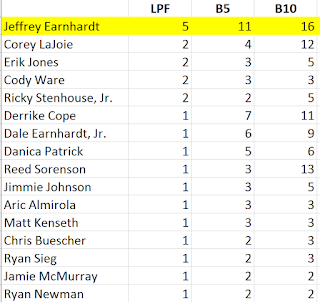 With 12 races to go, Earnhardt now leads the 2017 LASTCAR Cup Series championship by 3 finishes. Since his most recent last-place finish, Earnhardt and his Circle Sport with The Motorsports Group team have acquired new sponsorship from the Hulu online streaming service. 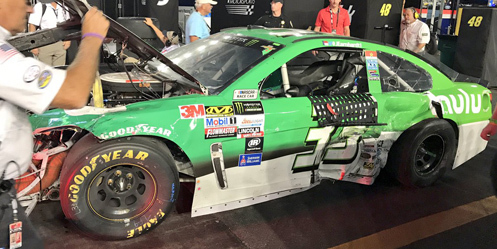 The current green-and-white paint scheme – which replaced the “Intimidator” styled black-and-silver – debuted the next week at Dover, where Earnhardt came one spot short of tying his season-best 26th in the Daytona 500. Though he has since tied that mark at Indianapolis, driver and team have continued to struggle. Even with “road ringer” Boris Said and engines from Hendrick Motorsports for Sonoma and Watkins Glen, the car finished just 29th and 30th those two rounds. Bristol, however, was a track where Earnhardt had been showing improvement. After a 32nd-place run in his Cup debut at the track in 2016, he ran 29th in the fall, then 27th for Circle Sport this past spring. Earnhardt was one of 41 entrants who arrived to attempt Saturday’s 40-car field, the first time since Talladega in May that qualifying would send at least one team home. With the Charter earned from Circle Sport’s efforts, Earnhardt had no risk of missing the cut, which was a good thing after practice. Car #33 ran 40th in the first session, 38th in Happy Hour, and earned the 38th starting spot with a lap of 123.364mph. The only driver to miss the cut was Timmy Hill, who in his first Cup attempt since a career-best 14th at Indianapolis, could not get a handle on his #66 CrashClaimsR.us Chevrolet and spun in practice. Starting last on Saturday was Joey Gase, who was driving BK Racing’s #23 Best Home Furnishings Toyota for the first time since Kentucky. Prior to the start, he was joined at the back by 3rd-place starter Kasey Kahne, whose team had to change a flat tire on the #5 Rated Red Chevrolet. When the race started, Gase and Kahne were part of a three-wide battle for position in Turn 3, which was settled at the stripe with Gase back in last, 5.394 seconds behind. Gase lost another second to the leader the next time by. On Lap 5, Brad Keselowski plummeted to 31st in his #2 AutoTrader Ford with the left-front tire flat. A chain-reaction incident sent him bouncing off the #38 Juice Battery Ford of David Ragan, then into the outside wall, forcing a green-flag stop. Keselowski lost three laps, and quickly took the spot from Gase, who lost his first of 24 circuits on Lap 12. By the 43rd lap, Gase was on the same lap as Keselowski, both three laps down, when NASCAR indicated that Gase’s window net may be loose. On Lap 60, Gase made an unscheduled stop for the net, taking last from Keselowski. Unfortunately for Gase, he pitted just before the first caution fell on the 63rd circuit for Aric Almirola’s flat tire, trapping Gase five laps behind. At the end of Stage 1, with all 40 cars still running, Cole Whitt entered the last-place battle. Whitt was called to pit road for leaking fluid which the team indicated was due to a power steering issue. On Lap 133, with the race still under yellow, Whitt took last from Gase, then returned to competition 13 laps behind on the 137th circuit. By Lap 177, Gase was losing more laps as he fought to keep pace, and that time by was within four laps of re-taking last from Whitt. By Lap 232, Whitt was still last, 15 circuits behind, three laps ahead of 39th-place Gase, when an accident settled the last-place battle. 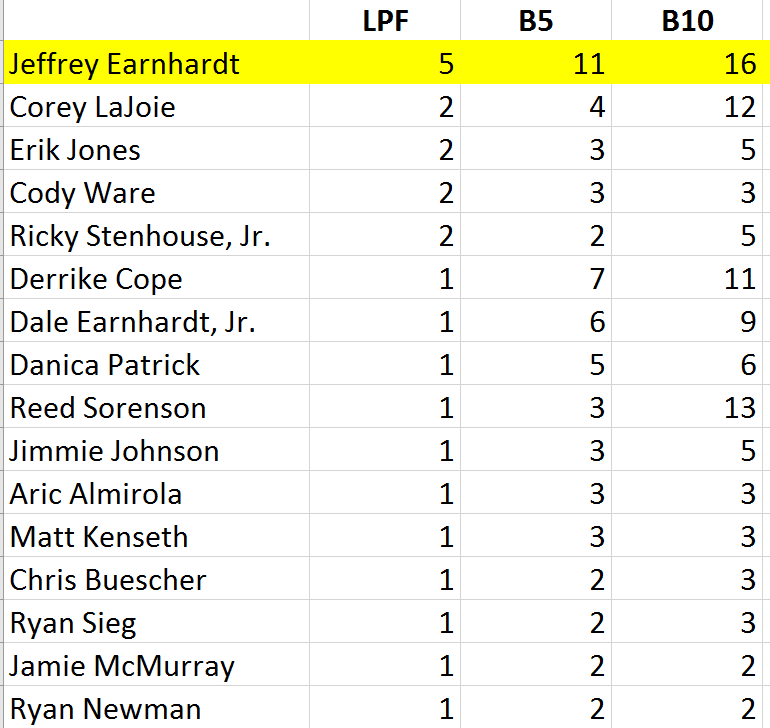 At the time Jeffrey Earnhardt was running in 37th, already seven laps behind the leaders. As he worked through the high lane in Turns 3 and 4, Austin Dillon’s #3 Dow Energy & Water Chevrolet suddenly switched ends in the lower groove. A flat left-rear tire cut down on a restart sent Dillon’s car spinning up the track – directly into Earnhardt’s path. Unable to avoid him, the two cars collided, causing enough damage to put both cars behind the wall and out of the race. By virtue of his seven laps down to Dillon’s two, Earnhardt was ranked lower, and he took last for good on Lap 241. Finishing 38th behind Earnhardt and Dillon was Reed Sorenson, who for the first time this year ran a white paint scheme on Premium Motorsports’ #15 Low T Centers Toyota, only to retire with transmission issues. Aric Almirola’s frustrating night in the #43 Smithfield Ford ended after 390 laps following a multi-car accident which involved front runner Chase Elliott. Rounding out the Bottom Five was rookie Ty Dillon, who himself was involved in two accidents before he pulled into the garage with severe damage to the right-front of the #13 GEICO Chevrolet. *This marked the first last-place finish for the #33 in a Cup race at Bristol since March 16, 2014, when Timmy Hill’s #33 Little Joe’s Autos Chevrolet – also belonging to Joe Falk of Circle Sport – crashed after 160 laps of the Food City 500.